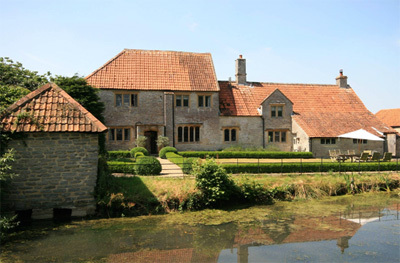 Standerwick Farm is an historic Grade II* listed former manor house dating from the 14th/15th centuries near Castle Cary in the heart of the Sparkford Vale. Although the property has Medieval origins, dating from around 1400 and 1550, the main body of the principal house dates from later periods. Built of local stone with a tiled roof (originally believed to be thatched), the stone mullioned windows have leaded lights, and some of the glass within these is estimated to be centuries old. Other period features include flagstone floors, cross-beamed ceilings, window seats and 17th century panelling in the dining room. Acquired by the present owners 15 years ago from the National Trust, the house has undergone a programme of restoration and now provides excellent family accommodation over two floors with three staircases. The kitchen lies at the heart of the property while the dining room and drawing room a have open fires; the latter had a useful adjoining office which in turn leads to the conservatory. Five double bedrooms and three bathrooms occupy the first floor, all accessed by three separate staircases. Outside, there are gardens on three sides of the house, all laid to lawn, while the large garden to the south is divided from the pond by railings; the pond is believed to be the remainder of the original moat. Further lawns are complimented by a small woodland garden and an orchard with young apple and pear trees. To the north is a good range of traditional farm buildings including some stables. The land (just over 39 acres in total) is generally laid to pasture while the bothy has been converted into a one-bedroom residence. The cottage is let under an Assured Shorthold Tenancy and the land does have some public footpaths. Standerwick Farm is located in the Sparkford Vale almost halfway between Somerton and Castle Cary with its direct rail line to London. Foddington is just a couple of miles from the village of Babcary. The guide price is £2,025,000. For further information please contact Chesterton Humberts on 01935 812323 or visit www.chestertonhumberts.com.